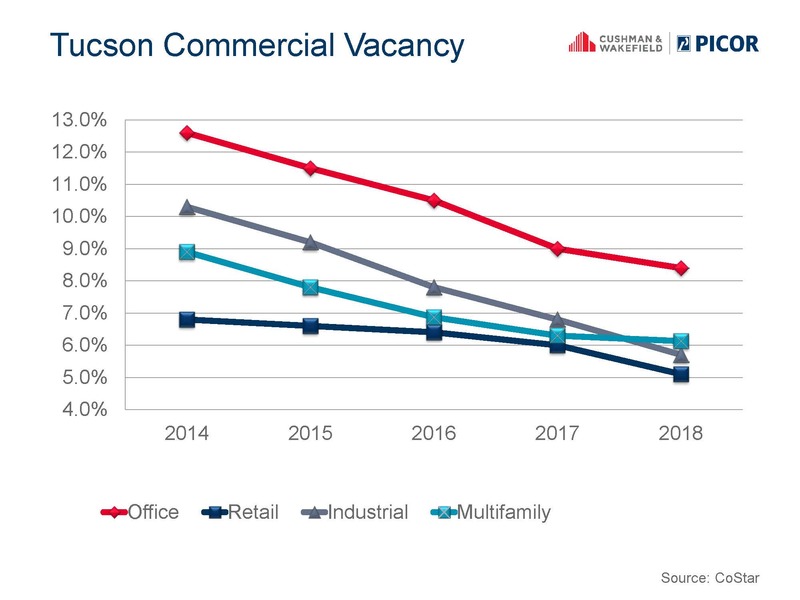 The Tucson commercial real estate market regained full health in 2017, a time when vacancy rates dipped into single digits across all segments of the market (office, retail, industrial and multifamily). 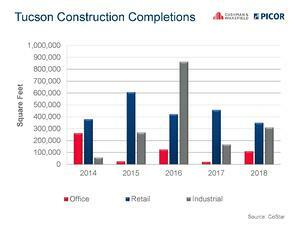 During that year, commercial lease and sale transactions regained a healthy head of steam, with volumes reaching levels not seen since the pre-recessionary years of 2006 and 2007. Uncertainty largely evaporated from the minds of business leaders and entrepreneurs, making way for expansion plans which continued throughout 2018. Numerous quality, high-waqe employment announcements were rolled out, including now familiar corporate names who become part of Tucson's fabric such as Caterpillar, Raytheon, Amazon, Axiscades, TuSimple, and others. While the intangible community optimism rose with each announcement, the tangible, positive impact of many of those hiring plans will be realized in the years ahead when new wage earners invest and spend locally. build a multi-story facility in midtown to accommodate its growth with new development allowing a customized, optimal floor plan. Downtown, once preleasing thresholds are met, JE Dunn will break ground on Tucson's first high-rise office tower since the 1980’s. Much needed hospitality space has been approved by Rio Nuevo with five hotel projects in early planning and development stages downtown. Opportunity Zones, empowered by the 2017 tax laws and identified by the municipalities with support from Arizona Commerce Authority, provide incentives and a mechanism to bring investment to the census tracts with the greatest need. We are also in an age of disruption. With a 'glass half full' perspective, changing times create opportunity. Adaptive reuse of aged buildings means conversion of existing bricks and mortar to align with new market demand. 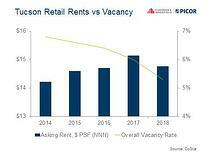 This trend is most prevalent in the retail sector. Upheaval of traditional models and the rise of e-commerce do not mean that malls, shopping centers, and other retail space are doomed. Instead, a time of change calls for innovation and sensitivity to consumer demands. Foothills Mall, being reinvented as “Uptown” by Bourn Companies is a prime example. As video stores gave way to a new generation of retailers, so have department stores been pressured. Note entertainment venues leasing former Sears and JCPenney locations, and the last remaining Kmart in Tucson announcing closure as a sign of the times. E-commerce growth shifted demand for a segment of traditional store space for goods to the industrial sector and logistics providers who warehouse and transport goods. Restaurant and entertainment spaces are on the rise, and medical and ancillary services previously centralized are creating satellites in neighborhoods for consumer convenience. Unfortunately, not all the news is good. Median household income in Tucson significantly lags the metropolitan area and nation as a whole. 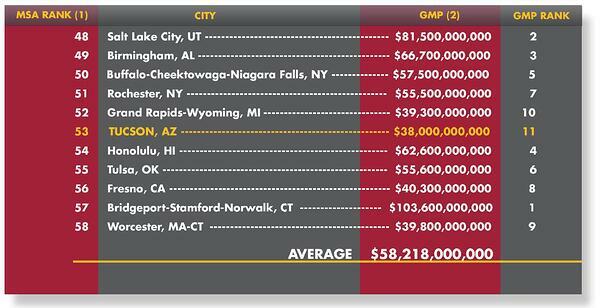 This affects all of us, as the resulting gross metropolitan product (GMP) in our region is 35% below the average of a 10-peer city cohort (Source: Tucson Metro Chamber). Legislated minimum wage increases begin to make a dent, as living wages are a positive for community health; however, it takes time for businesses and nonprofits to adjust to the budget hit. We are in a talent war with other communities to attract and retain the best and brightest, from skilled labor to the most formally educated. Tucson needs quality jobs across the educational spectrum, and workforce development is a concerted, community-wide public/private effort, whose impact affects us all. And while we speak of collaborative efforts, the level of trust and cooperation between the public and private sectors in the Tucson region still has room to grow but is at a high water mark in my three-decade career. Progress and success has taken intentional leadership, and we owe it to ourselves to capitalize on this environment of trust to solve our community’s most pressing issues, from education to water policy and transportation needs. Positive change requires vision, capital, trust, sound planning and execution. We are well positioned as a community to take our progress to the next step. It’s an exciting time for us. Barbi Reuter grew up in Tucson and is President of Cushman & Wakefield | PICOR, a Tucson-based, employee-owned commercial real estate services provider (www.picor.com). She was named Small Business Leader of the Year in 2017 and currently serves as Board Chair for the Tucson Metro Chamber, as a board member for Sun Corridor Inc,, and YMCA of Southern Arizona, and is a Greater Tucson Leadership graduate. Reach her at breuter@picor.com.